The information here has been provided by Dale, as his recollection of the early days of the SCCNSW Club. The Studebaker Drivers Club was formed by Harry Barnes & some friends in New York in 1962. Phillip H of Oakdale was the original representative of SDC in Australia. His Father owned a fully restored 1928 Studebaker Director 2 door coach. We were visiting his family in our first GT Hawk reg #DAE458. After a lengthy discussion with Phillip and learning the history of SDC, I decided to join SDC, which I did in 1967. In 1968, the SDC informed me that the SCCA (Studebaker Car Club Australia) had been formed in Victoria and it would be beneficial for me to join SCCA. Coincidentally at that time we were attending a Hot Rod show at Burwood in our GT Hawk. On returning to our car after the show we found a note under our wiper arm from Helen & Charles S, who were visiting Sydney at the time. Helen, who was the secretary of SCCA invited us to join SCCA. Thinking that SCCA was a chapter of SDC we promptly joined. Several months later when our Stude Bulletin, the forerunner to Turning Wheels failed to arrive, the SDC informed me I was no longer a financial member and that SCCA was NOT a chapter of SDC. In 1972 Helen S informed me that as there were now about 20 NSW members it might be advisable to form a branch of SCCA in NSW. Subsequently Jennifer T placed an ad’ in the Herald which resulted in a meeting at her home in Carlingford. At this meeting on 21st August 1972 it was agreed by those present that a branch of SCCA be formed. After about a 3 hour discussion it was decided to adopt the Victorian Constitution, modified to suit NSW. The fees were set at $6 per year. It was agreed to hold a further meeting in one month at the same address to formally establish the car club. The second meeting was held at Jennifer's home on 20th September 1972. At this meeting the election of office bearers was held after the collection of fees. Future meetings were to be held on the 3rd Tuesday of each month at the Uniting Church Hall in Hurlstone Park at 8pm. I was the only member of committee on this run. A short time later we were advised that neighbors of the Church Hall had complained of the cars parked in the street (ONE NIGHT PER MONTH!) & the Church asked that we find an alternative venue. Eventually we moved to Drumoyne Civic Centre and meetings were held there for several years. Graham C, Black '64 Cruiser (gen 6000miles) Now owned by Darryn F.
Rob S, '62 GT Hawk, Now owned by Dale F.
Our first Motorkana was being organized by Barry H, a founding member, when he passed away with Leukemia. The Club decided to hold an annual motoring event in Barry's honor. A shield was made with plaques for the winners name on it. This has not been held in recent years. On one annual Motorkana held in a paddock at Morrisset in conjunction with the Newcastle Club there were a few scary moments as contestants navigated the uneven terrain for various events. We held a Concours at Vaucluse House one year which attracted a lot of attention from visitors on the day. Several Concours were held at Castle Hill Park. On one of these Bert Needham was going to give me a surprise by driving his 64 Commander 2 door race car to the event. He was tuning it in the presence of several interstate members on the Saturday preceding the Concours on the Sunday. He was showing what the engine would peak rev at & leaning over the engine to do so, when the viscous fan disintegrated & one of the blades hit him in the head. This put a dampener on our Concours the following day; however it was decided to proceed because of the commitments already made. Bert was in a coma for several weeks before passing away. While on another club run held in Royal National Park south of Sydney a bush fire broke out, & the fire brigade arrived & asked us to evacuate the area. Clare G, an elderly owner of a 1939 Commander which she had owned from new, asked me to drive her Commander and Yvonne drove our 1963 Cruiser. We were located to a safer spot. In the early days visitors from interstate clubs attended & we held a get together on the Saturday night, usually at one of our members house. The trophy presentation was held after the Concours on the Sunday night. Usually , in the case of Castle Hill in the rooms at the venue, the old Castle Hill RSL which was adjacent to the park. A hot meal was prepared & served by the ladies in the club followed by the presentation of trophies. This was a great venue as the Council of the day allowed us to use the park to showcase our cars on the grass. Being on a main road & opposite the shopping centre attracted a lot of interest from passers by. In 1978 it was decided to publish our own magazine & it was Yvonne's suggestion to call it "Stude Torque" At this time we had 55 members. After a few years this magazine was discontinued as the original printer was no longer available & the contributions from members had declined, so it was no longer viable. The first National meet was held in Cooma NSW in 1975. This was primarily organized by Chris Priestley. At this National it was decided to hold this event every 2 years with each State taking it in turn at holding a National meet. There have been 4 people nominated for Life membership in the NSW Club. Clare & Dan have since passed away. When there were sufficient NSW members from the Hunter region they decided to form the Newcastle SCCA. This also happened at Dubbo when Robin Blekemore organized the Mid West SCCA catering for people in that area . Queensland had 2 Clubs at one time, however the SCCA Sunshine Coast eventually merged with the Queensland SCC when their membership declined. There is now a club in each state except Tasmania & the NT, but only NSW has 3 clubs. At the time of the 1979 National Meet in SA, SCCA Victoria felt as each state had different liability laws it would be better if all clubs were independent of each other. Victoria would however continue to publish the National magazine Stude News with input from each separate club (no longer branches of SCCA) This way SCCA would not be legally liable for any financial or other problems that may occur interstate for any reason. In 1979 a National Meet was held in Adelaide & the SA club had invited Brooke Stevens to attend, which he accepted. I was fortunate to be able to spend some time talking to him about design in general & managed to get him to sign my owner's handbook for the Hawk, wishing I had remembered to take along the handbook for the GT as well. About 1975 we instituted a "junior" membership, at a nominal fee, to encourage those children of members who showed any enthusiasm for Studebakers. As you can imagine our sons Dale and Darryn became the first such junior members. Darryn has truly been well infected with the Studebaker "virus". There are not many young children involved in the club now, as the membership generally has aged over the past 37 years since the club was formed. In conclusion, of the 90 odd motor vehicles I have owned, almost half of these have been Studebakers, as many as 6 at one time. I have owned my GT Hawk for over 35 years. 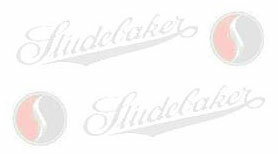 I have enjoyed the many occasions of sharing this enthusiasm for Studebakers with other fellow enthusiasts over the past 40 years & continue to do so to this day. This page last updated 23/06/2010.